12 May, the main fragment of a disintegrating comet will pass within 10 million km of Earth. That’s close enough to see it through a pair of binoculars, just before dawn. Is this large ball of ice and dirt, that astronomers have labelled “fragment C”, likely to fall to Earth? Not at all, in fact, since 10 million km is more than 25 times the distance from the Earth to the Moon. This could be the last chance to see Comet Schwassmann-Wachmann 3—named after the 2 German astronomers who discovered it in 1930—as its disintegration is now accelerating. The comet began to break apart in 1995, when it splintered into 3 pieces under the effects of the Sun’s heat. Since then, it has continued to break up into more than 40 fragments. 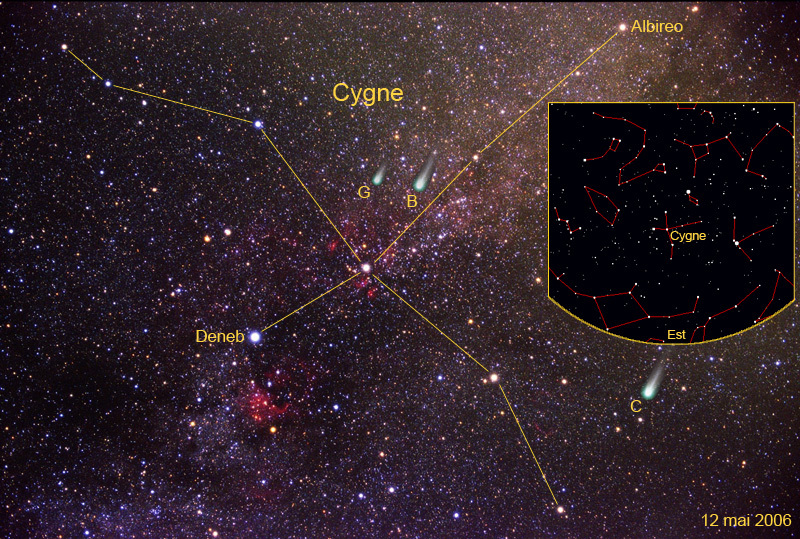 In the early hours of 12 May, you should be able to view the main fragments of the comet through binoculars in the Cygnus constellation, which is easily recognizable in the shape of a large cross. Fragment C is likely to be the brightest. The inset shows a picture of what the sky will look like on 12 May at around 4:00 a.m., above the horizon to the east. The light of the almost full Moon will not make viewing easy, since it will not set until a few minutes before the 1st light of dawn, around 5:30 a.m. The comet’s break-up is a fantastic opportunity for astrophysicists, who are analysing light reflected by its fragments to gain a closer insight into the nuclei of these mysterious “hairy” celestial bodies. Their research could have far-reaching implications, because comets are the best-preserved remnants of the primitive nebula, the cloud of gas and dust that gave birth to our Solar System. In 2014, Europe’s Rosetta space probe will go into orbit around Comet Churyumov-Gerasimenko and begin its own exciting science mission in search of our origins. Once there, it will release the Philae lander onto the comet’s surface to unlock its inner secrets. France is a major contributor to the Rosetta mission initiated by the European Space Agency, notably supplying the CIVA imaging system and the Consert sounding radar. Many French scientists also worked on other Rosetta instruments and will be exploiting data collected.